Yet again February 2nd and there is nothing i can do about IT. That is from the Groundhog Day movie, which became a synonym for all the things that can be seen redundantly every single day throughout the whole year. Yeah, even when you search Google for a nice picture, just redundancy. And nothing different in SCN. Having the moderation box empty when going to sleep, it is filled up again in the morning. Why should it be different? Every day new babies are born, every day we get new members in SCN. Quite paradox, if every day is February 2nd then the same baby should see the light of the world. I guess it is even so we some members, they just have then a different user name. Some have the same user name – and do not even imagine how dangerous this can be if another one with the same ID had annoyed the moderator recently. Please help me to get out of the Groundhog Day loop. Please try your best to not getting into this loop yourself. Together we are strong too, let us try to get out of this. Imagine … the year 2003 … where have you been? what was your age? Imagine… all the things happened since then. Quite a lot, right? By the way, it was the year when SCN (formerly SDN) was founded. Imagine… how much questions have been asked since then. Imagine…could it be that someone else had the same issue like you before? Or just look at the number in the content page of a space, here MM for example. Now try to imagine again. Can it be that someone had the same issue before you? Let us try something else. Are you working for a company which is front runner and always first when a new Release or only a new Enhancement package is out? Or is it more like: At home I have already Internet Explorer 11 while it is just IE8 in the company? You can imagine what I want to say with this? With something really new you are probably the first with a new issue. But if you are on a release that is out for a longer time, then you can almost relax since someone else had the issue already and the solution is often right there to pick it up. I have put together some tips and information for SAP freshers, things which should be known and heed, as the help us to get out of this Groundhog day syndrome. When you search, get used to the SAP terms, which are quite different between the formal SAP help and the informal language in SCN. An example: if you are looking for help on purchase orders, then use the word “purchase order” when searching help.sap.com or service.sap.com (OSS). In SCN people are in a hurry, in SCN you will find more POs than purchase orders. But you can find purchase order in SCN too, but rarely a PO in help.sap.com. And it becomes even worse if you search with Google for PO in German language and your boss is right behind you. However a STO for a stock transfer order can be found in the official SAP pages. Looking for a TO (transfer order) in whatever place is useless as the search engines make no difference between a capital TO and a small to. Search not just once, vary the search terms and try it again. Searching for SAP notes in service.sap.com is challenging too. If you got an error message, then search with the message number, once concatenated, once with a space between message class and number. Log off and on again, maybe you get a different server which has totally different results (don’t know how they make this) . Searching in English and in German may also get you different results (don’t be afraid as a chicken – if you search with numbers – they are equal in both languages), hence it can be considered as an extended search functionality. Also make use of the automated search ANST What is ANST….and why aren’t you using it? and the new PANKS Got an error message? The new tool PANKS is here to help you! I am always curious how somebody could find something that I did not find, in such cases I read the content and do then a search with other terms until I an find this content myself. I mean the software, the support desk is a different story. You know, SAP does not like you, hence it does anything to annoy you from 9 to 5. What ever you enter it fires error messages, express messages, pop-ups and dumps. And because of all this torture SAP jobs were well paid. But since SCN the pain is no longer that big – so the compensation. Error/warning/information messages, they can appear in the status bar, as a pop-up, or by calling them explicitly via an icon in the screen. They are a designed communication between SAP and you. Important to know is that you only see the short version on first sight. There is usually a question mark in the pop-ups and the message containers. By clicking it you can get a more detailed information about this error, often along with an instruction for a solution. Some tell you nicely that you shall contact the administrator, if you are not the end-user, then this message means you. Other messages are unfortunately declared as self-explaining – some are – some not. If the message appeared in the status bar, then just double click to see the long text. What all messages have in common is that message class and number is listed above the long text. Please do not free translate the messages, post it 1:1 exact, always post the message number too. The message number makes a message unique. T100 table has all SAP messages, my IDES system has 525756 messages for english language only. What do you think how often the same text is used with different message numbers? it gives feedback that you had seen the long text of the message. You wont believe how many people are surprised that SAP has a long text to many of their messages. SAP has an own email system, where users can send emails to another SAP user. And such messages can be marked as express messages. You get a pop-up when such messages arrive, but only if you are active. SAP will not disturb your sleep, it only bugs you when you do something. Such express messages are as well used when the system is talking with the user about something important. E.g. when you believed to have a document saved and SAP didn’t take it into the database. Unfortunately most times this pop-up for the express message has no understandable message for the user. But it should really not be ignored even it is talking moon lingo. Use SM13, it has all failed postings, select yours and click the header icon. There you can find a more clear message about the problem. Don’t just post “I got an express message” in SCN, first do your analysis in SM13, then search SCN based on the findings from SM13, and if you haven’t found a discussion with a solution, then ask. Dumps are ABAP Run time errors. This communication is chosen if something unexpected happened which was not foreseen by the programmer. They look complicated on first sight, but this should not be a reason that you just forward it to SCN. Read this document ABAP Dumps , it explains how a Dump is structured and where you can find which information and what you can do. In many selection screens you can find a program documentation behind the blue info button. From the menu HELP you jump directly into the application help in help.sap.com, sometimes even to the correct page. But no matter where you landed in help.sap.com, you have a search box there too. Interested in Table names / field names? Many fresher are. 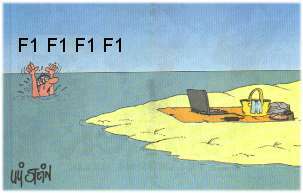 Solution: place the cursor into the field, hit F1, then click the icon for technical field help. Voila: in the pop-up you can usually see the table name and field name. In some cases it is just a structure name, then go to SE11 enter the field name and click the where-used icon and limit the search on tables. Details can be found in How to find Table name for a Field which is shown structure name on press F1. Searching for Transaction codes and where they are in the menu? Honestly, if your dream is to become a consultant, then you should know the menu of your chosen module, like you know your neighborhood. Forget the favorites, they are making you blind for the rest. Get used to the menu structure, which is in most cases logical grouped, and you often see the same structure in IMG too. But if you really need to search for something, just do it in your system, using the binocular icons or just enter search_sap_menu into the command field. If you already found the name of a customizing table and want to know where the customizing activity is, then go to SM30, enter the table name and click customizing. What is the BADI / User exit for ….? Do you really want to ask this in SCN until you retire? Never asked yourself why others are able to answer this question? There are ways to find them in SAP itself, e.g. with a transaction Would you like to SNIF? : All you enhancements at one blick or a small report Looking for user exits for a specific transaction? Wow, you made it till here. Looks like you really want to get to February 3rd. You want to know where to search first? Hmm, I am not sure if there is a golden rule. If you are a beginner to SAP in general then really make use of F1 and help.sap.com and read SCN content. If you are a little more experienced and your issue has a taste of bug then start looking for OSS notes in service.sap.com. You are new in a company? Approach your colleagues! They know what special things they implemented. That was it, what should be known and heed by all our freshers to reduce the amount of basic and redundant questions in MM and other spaces. In case some experienced folks has read this too and want to add some tips, please do so in the comment section. It’s really great document!! Thanks a ton for sharing.. I bet you are a treat at parties Jurgen. …thank you very much for making&keeping MM forum a usable tool for us. I always thought to write a blog like this but never could. Glad to see that how smartly you have explained and covered all areas and this is must read document for every newbie and every old member as well. Thanks for writing such a wonderful Blog. I especially like the portion SAP talks with you. You are incredible, Jürgen! Even after having plowed the guts of SAP ERP during the last 20 years, I still find your article really enthralling! You are like our “papa” on this forum (or maybe this is another word for “moderator”?) Keep on your great work! Thanks for share your kownledege with us. I was wondering if you could add some advices about customizing SAP ECC?. For example naming conventions to use when you create new document type, order type. Really helpful blog. Thank You Sir.. Thanks a lot , very well done. thanks Jurgen, it was really helpful for newbies.. like me.